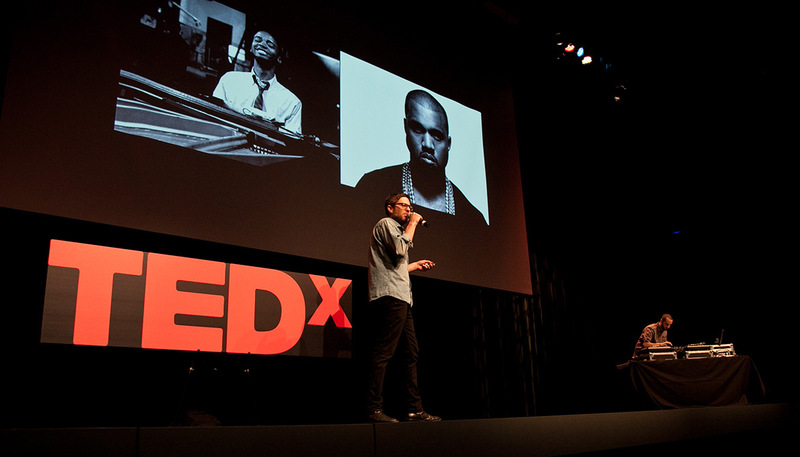 Since its debut in 2013 at The Santa Monica Museum Of Art, DJ/Producer J.PERIOD and USC Professor Josh Kun’s groundbreaking THE ART OF THE CROSSFADE lecture & performance series has garnered rave reviews at venues including TED Talks, The Recording Academy’s GRAMMY U “Summer School” Series, SXSW and Southern California’s The Oakwood School. Pushing the boundaries of a traditional lecture, THE ART OF THE CROSSFADE explores social issues at the intersection of music and culture by fusing an academic lecture with a live DJ performance to engage audiences in an entirely new way. While Professor Kun discusses music, diversity and the symbolism of the DJ crossfader, J.PERIOD brings the metaphor to life on stage: mixing music, scratching and sampling to create live musical hybrids. Dancing between abstract concepts and concrete demonstrations, THE ART OF THE CROSSFADE illustrates how music can provide not only a vehicle for cultural exploration, but a profound new metaphor for the “mixing” we all do in our increasingly diverse lives. Watch an excerpt from J.PERIOD & Josh Kun’s 2014 performance of THE ART OF THE CROSSFADE at TEDxPCC (inset). Or CLICK HERE to watch the full TEDxPCC performance (Running Time: 20:53).